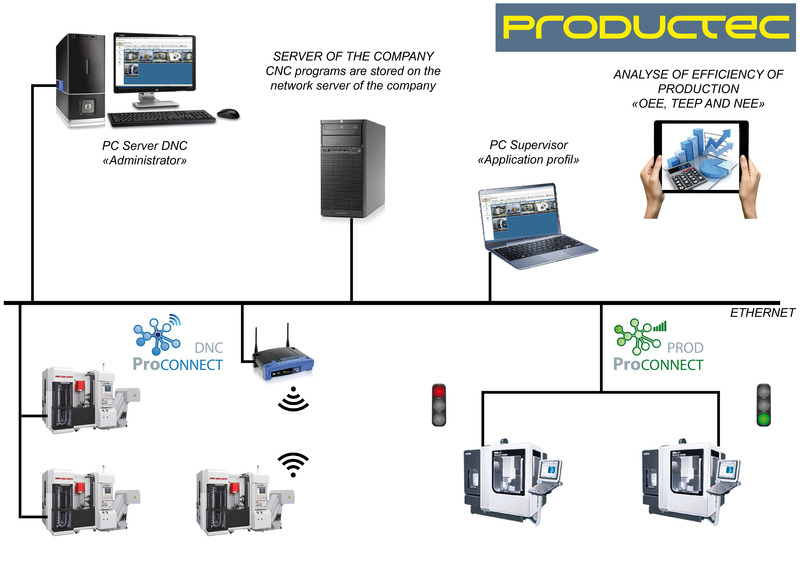 ProCONNECT DNC is a communication software for CNC-Machine allowing you to transfer you machining program to you CNC-Machine. ProCONNECT DNC allow you to call the machining program from your CNC-Machine desk and so avoid the travel for the operator. A user profile allow you to personalize your work interface depending on your rights. ProCONNECT DNC import automatically the machining files designed by your FAO software and make them available to your machine operators. A management of the program by clients, part, and repository is integrated with the ability to associate standard Windows document to the program. Software to get the machining status complementary to ProCONNECT DNC. Allowing you to visualize the production time of a CNC-Machine or a charging station. A simple interface allow you to see the state of the production in real time. Show you directly the machine state on the machine icon. Visualization of the program being machined and the number of fabrication order. Exportation module to Windows Excel allowing the client to use these data very easily with macros. The alliance between ProCONNECT DNC and ProCONNECT PROD allow you to calculate the Overall Equipment Effectiveness (OEE) of your production. The rates of availability, performance and quality are continuously analyzed to be able to give the necessary information to the manager allowing him to take the best decisions. Many well-known watchmakers are already using an ODD solution and can already measure the positive effect only after a few utilization week. You can beneficiate of this pertinent system of analysis with real high profitability objective. Contact Productec without delay!